Seniesa “Super Bad” Estrada (12-0, 2 KOs) successfully made her debut under the Golden Boy Promotions banner with an impressive eight-round unanimous decision victory against Mexico City, Mexico’s Sonia Osorio (8-6-1, 1 KO) in the exciting main event of the March 16 edition of LA FIGHT CLUB at the Belasco Theater in Los Angeles, Calif. and televised nationally on EstrellaTV’s Boxeo Estelar. After eight rounds of action, the pride of East Los Angeles, Calif. won with three scores of 80-72. VIP guests for tonight’s event included Lupillo Rivera, Niko Valdes, Pablo Rubio, Jr., Alexis Rocha Joet Gonzalez, Vadhir Derbez, Rafael Gramajo, Tenoctitlan Nava, Raul Curiel, Oscar Negrete, Hasim Rahman and Alfonso Gomez. In tonight’s co-main event, Oscar Duarte (13-0, 9 KOs) of Parral, Mexico fought an intelligent and aggressive fight before stopping Jose Rodriguez (10-2, 10 KOs) of Tepic, Mexico at 1:53 of the fifth round. Duarte scored two knockdowns: one by a right hand in round four and a body shot that ended the bout in the first round. Jousce “Tito” Gonzalez (7-0, 7 KOs) opened the televised portion of the card with a first-round TKO victory against veteran Mexican pugilist Jose Martinez (10-12, 6 KOs) in a bout initially scheduled for six rounds in the lightweight division. Gonzalez stopped Martinez at 2:48 of the first round. Antonio “Relentless” Orozco (27-0, 17 KOs) of San Diego, Calif. successfully returned to 140 pounds with an eight-round unanimous decision victory against the durable Mexico City, Mexico native Martin Honorio (33-13-1, 16 KOs). All judges scored the fight 79-73 for Orozco. 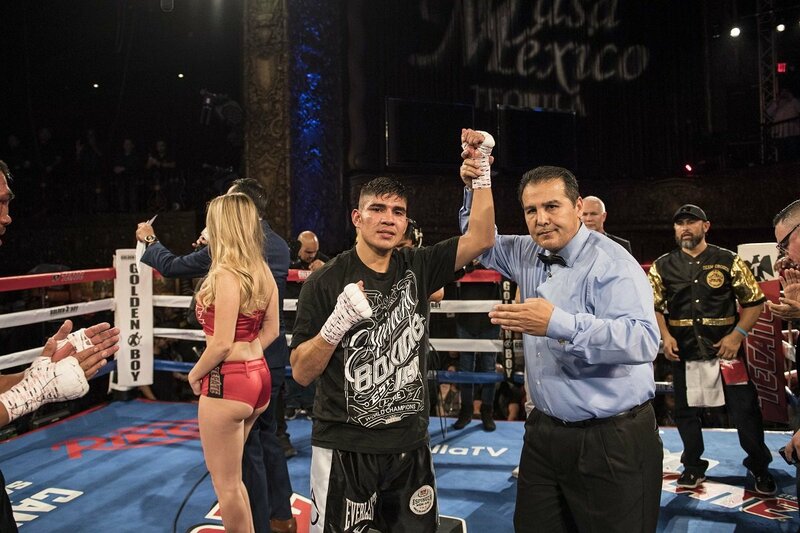 South Central’s Edgar “Kid Neza” Valerio (13-0, 8 KOs) scored a first-round technical knockout win against Giovanni Caro (26-21-4, 21 KOs) of Mexico City, Mexico in what was a scheduled eight featherweight battle. Blair Cobbs (7-0-1, 5 KOs) of Las Vegas made his Golden Boy Promotions debut by fighting to a controversial fourth-round technical draw against Mario Esparza (4-0-1, 1 KO) in the first bout of the evening, which was scheduled for four rounds in the super lightweight division. An accidental headbutt caused the cut on Esparza that forced the fight to be halted at :19 of the fourth round. Estrada vs. Osorio was an eight-round flyweight fight presented by Golden Boy Promotions. The event is sponsored by Tecate “THE OFFICIAL BEER OF BOXING” and Casa Mexico Tequila. The event will take place on Friday, March 16 at the Belasco Theater in Los Angeles, Calif. Mark your calendars and buy your tickets for the upcoming shows on April 6, June 1, July 6, Aug. 10, and Oct. 12.